Manmohan Parkash, Country Director, Bangladesh Resident Mission, Asian Development Bank distributes 'Merit Scholarship Award 2018' among the students of East West University at University Campus in the capital on Wednesday. East West University (EWU) provided 'Merit Scholarship Award 2018' to their 305 students from Fall 2017 and Spring, Summer and Fall 2018 semesters for excellent academic performance. Most of the recipients are female. 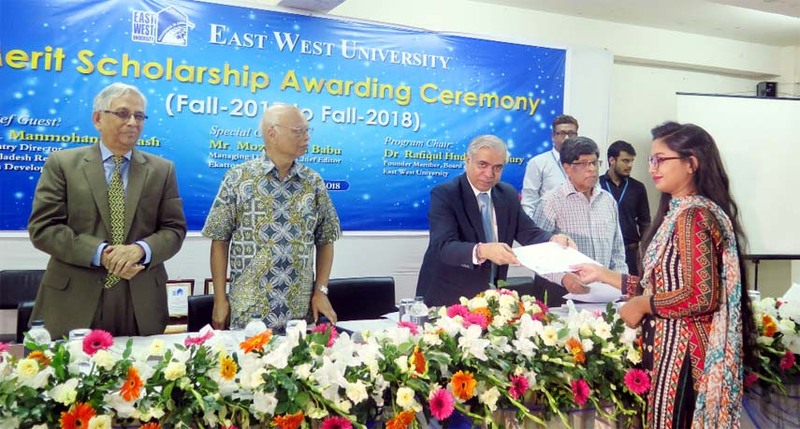 The scholarship-giving ceremony was held on Wednesday at the EWU campus, Aftabnagar, Dhaka. Manmohan Parkash, Country Director, Bangladesh Resident Mission, Asian Development Bank (ADB), attended the ceremony as the chief guest. Dr Mohammed Farashuddin, Chairperson, Board of Trustees, EWU, and former Governor of Bangladesh Bank, Prof Dr MM Shahidul Hassan, Vice-Chancellor, EWU also spoke on the occasion. Dr Rafiqul Huda Chaudhury, Founder Member, Board of Trustees, EWU presided over the program. They also handed over the certificates to the award recipients. On the occasion, speakers congratulated to the award recipients for their outstanding results. They also urged the students to dedicate themselves to nation-building activities and inspired them to work with sincerity from this stage of life and promise their dreams. Pro-Vice Chancellor, Treasurer, Deans of Faculties, Chairpersons of different departments, teachers, staff, recipients and their parents were also present at the ceremony.